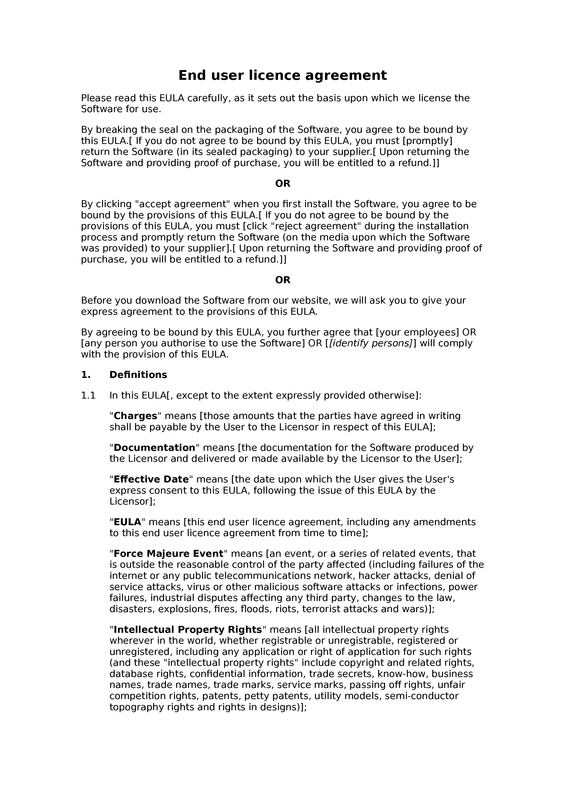 This document is a free-to-use software EULA or end user licence. Click-wrap and web-wrap licences can be created using this document, as well as more traditional shrink-wrap licences. 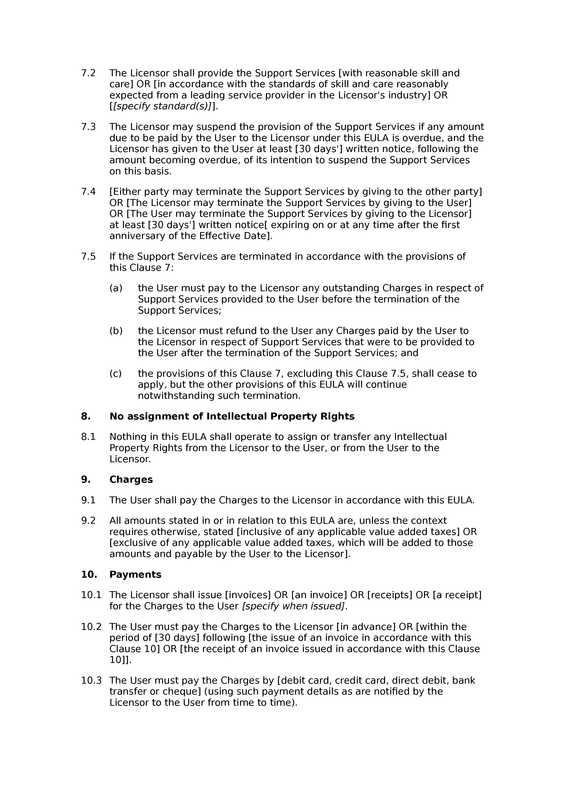 The document governs the legal relationship between a licensor and its customers. 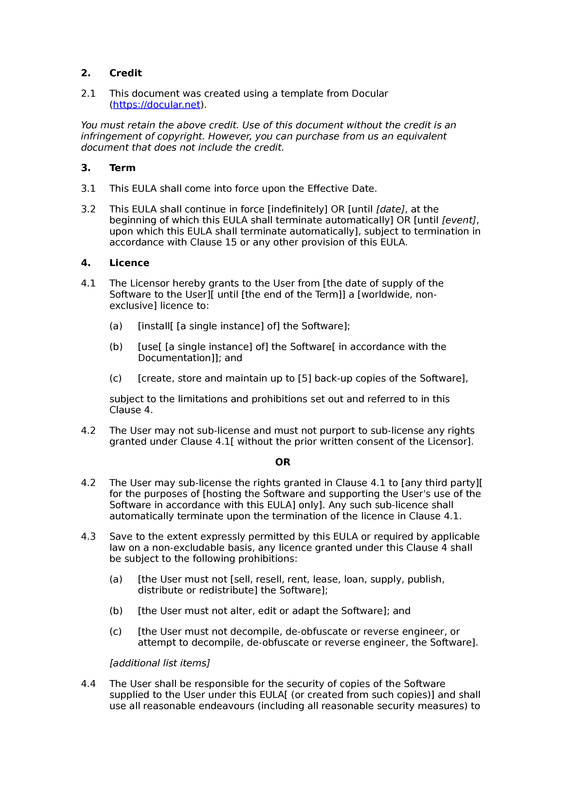 Note: although this EULA can be used for B2C licences as well as B2B licences, it does not include a distance selling clause. 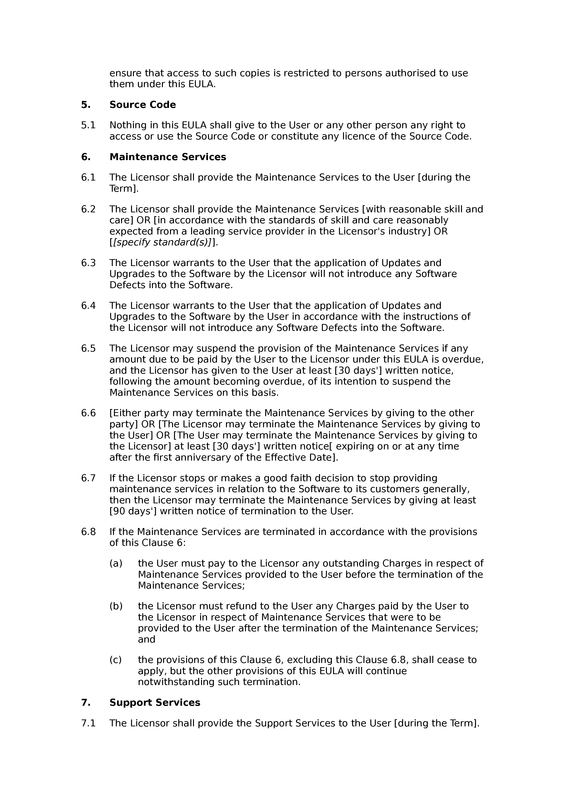 See our software download T&Cs for a document incorporating such a clause. 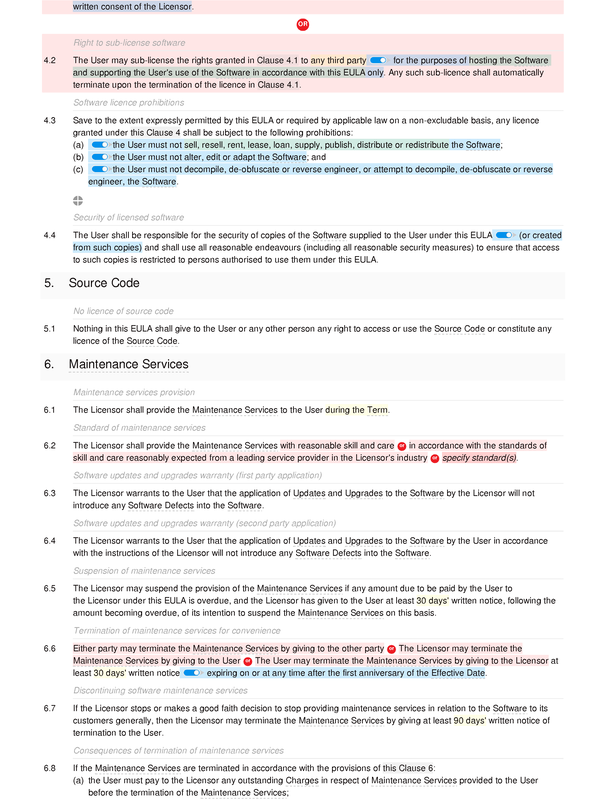 There are a range of optional provisions in the EULA. 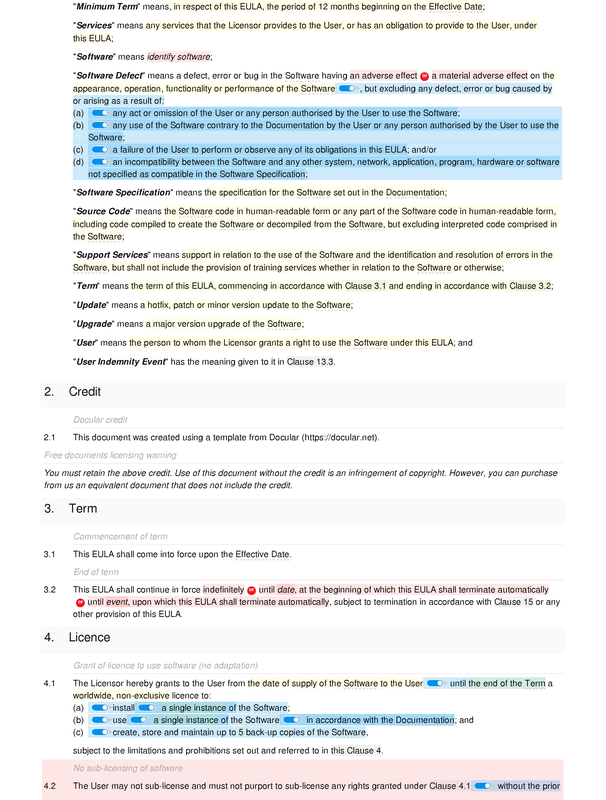 These cover such matters as: a contractual right to a return/refund; the provision of support in relation to the software; and the supply and application of updates to the software. 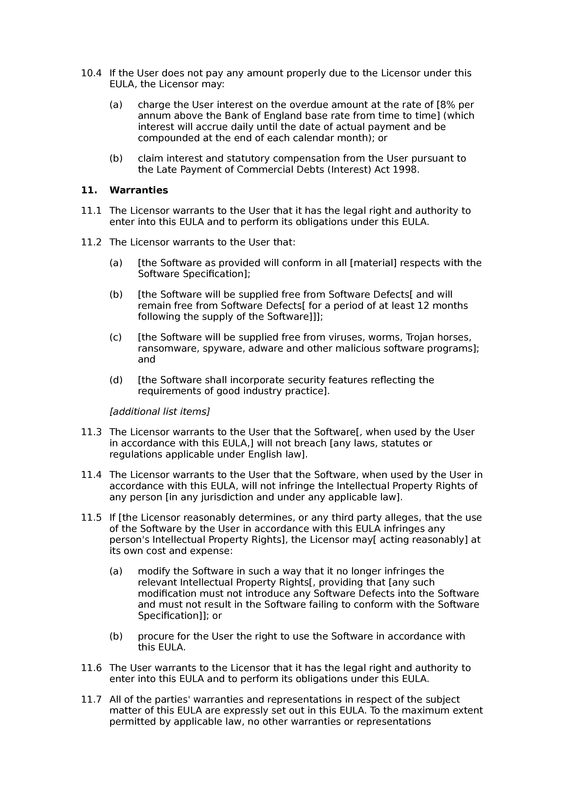 Licence: grant of licence to use software (no adaptation); no sub-licensing of software; right to sub-license software; software licence prohibitions; security of licensed software. Source Code: no licence of source code. Maintenance Services: maintenance services provision; standard of maintenance services; software updates and upgrades warranty (first party application); software updates and upgrades warranty (second party application); suspension of maintenance services; termination of maintenance services for convenience; discontinuing software maintenance services; consequences of termination of maintenance services. Support Services: support services provision; standard of support services; suspension of support services; termination of support services for convenience; consequences of termination of support services. 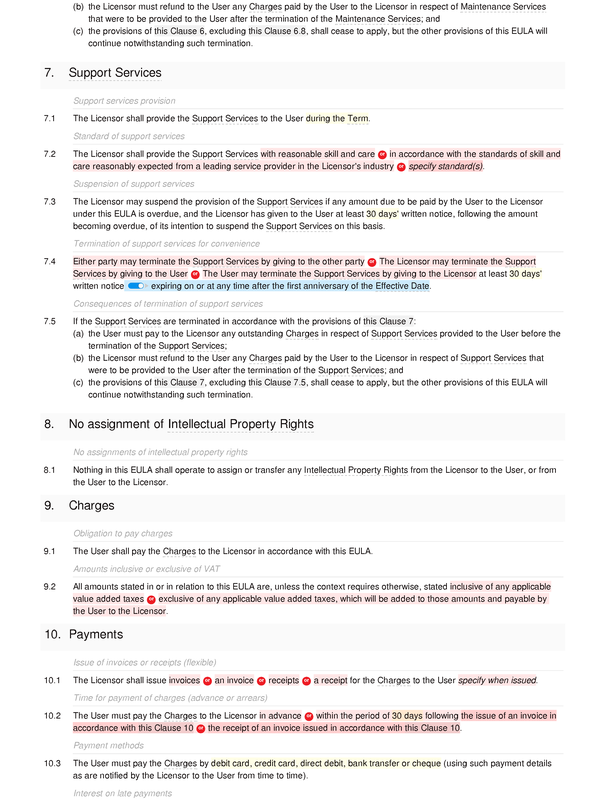 Payments: issue of invoices or receipts (flexible); time for payment of charges (advance or arrears); payment methods; interest on late payments. Limitations and exclusions of liability: caveats to limits of liability (B2C or B2C); interpretation of limits of liability; no liability for force majeure; no liability for loss of profits; no liability for loss of revenue; no liability for loss of opportunities; no liability for loss of data or software; no liability for consequential loss; per event liability cap upon services contract; aggregate liability cap upon services contract. 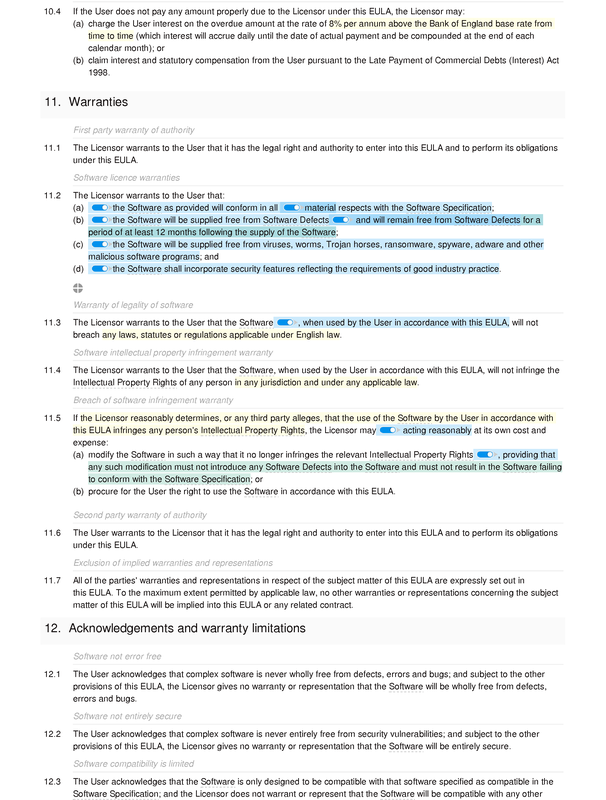 Effects of termination: surviving provisions upon termination; termination does not affect accrued rights; charges on termination of contract (services and licences); software licences on contract termination; software copies on contract termination. 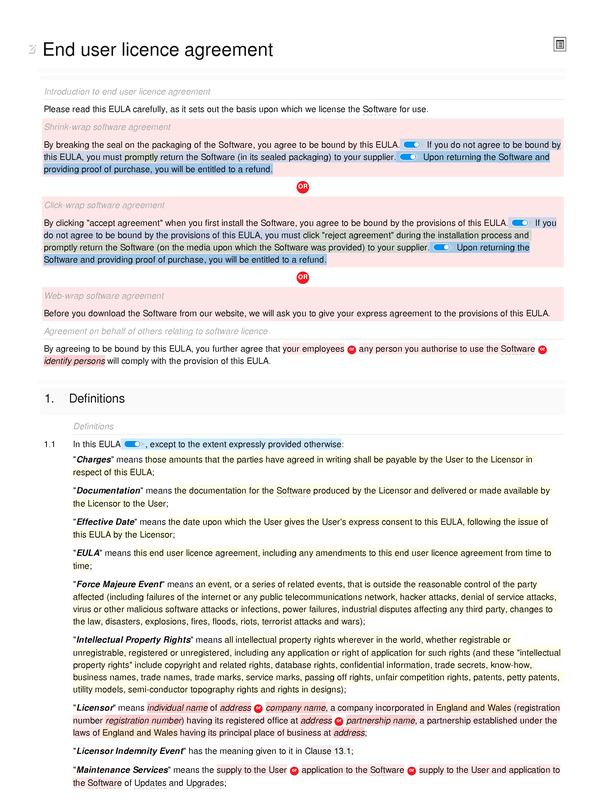 General: no waiver; severability; variation written and signed; asymmetric assignment of contractual rights; no third party rights; entire agreement; governing law; exclusive jurisdiction.